So, you remember how I told you how I was going to be an Auntie? It's going to be a girl! Oh my lord, the pink and frilly things I will be buying! Within minutes of finding out I was window shopping online. Sigh, so exciting. I mean, I'd be thrilled if it were a boy but a girl makes holidays so much more fun! Last week I discovered that hard liquor can't be purchased in my town on Sundays. What the hell, Alabama!? Sundays were made for Bloody Mary's! Clearly I need to work on filling up a liquor cabinet so this dire situation won't happen again. I have no idea why but I've been itching like crazy since moving here. I bought some baby oil so hopefully putting that on after showers will help. Ugh, my own scratching is driving me insane! I found a low-income clinic in the next town. If I qualify for patient assistance it's $20 per vist and $5 per lab. God, I hope I qualify. One of the things I was pricing was a full STI screening. The student clinic charges around $600 and Planned Parenthood is nearly $300 which is just way out of my price range. The clinic also offers mental health services so this could be a really good find. Fingers crossed. Dude, did you know they make Pumpkin Pie Pop Tarts? I only recently discovered their existence and I want them desperately. Alas, they don't carry them in local grocery stores. They're only around for a limited time and I'm so bummed I won't be able to try them. I love pumpkin pie. I really want to see the Dali exhibit at the High Museum of Art in Atlanta. It's running until January so I think I might need to take myself. While running errands, my roommate and I ended up looking at holiday decorations and I revealed that I've never had a stocking. Unacceptable, I know! So I found one that made me shriek happily. And that still makes me giddy when I look at it. 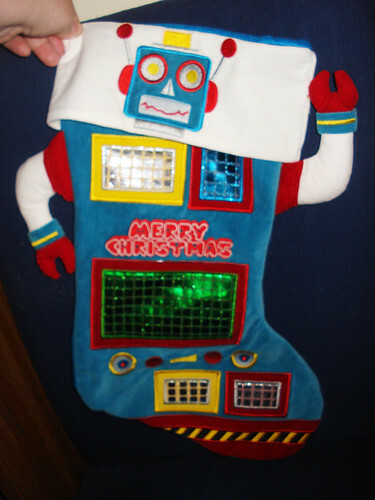 Robot stocking! Oh yes. I have a thing for robots. I looked at the boxed holiday cards because they were half off but every damn one of them had scripture in them. I realize we were in a Christian store but, come on, one could have just said Happy Holidays. I've had to cut my gift list way down but really enjoy sending cards so am hoping to find inexpensive ones. I've been searching eBay with some luck. We shall see. My sessions with the Fat Nutritionist start in December! Now that I'm moved and settled and have access to a working kitchen and actual food it's time! Nervous but super excited. I hate how jacked up and unhealthy my relationship with food is and I'm really looking forward to improving that. I must know where you purchased the robot stocking. What a cute Christmas stocking. I bet you will enjoy all the holidays this year. Dude, I should warn you: in many Southern towns, you can't buy beer on Sunday, either. Like, say, Atlanta. I expect people will jump all over me for this, but it worries me how much of what you talk about is buying things. Are you seeing a therapist in Alabama? in Nebraska, we have no-booze-before-noon laws. it's kind of ridiculous. anyway, I mostly just stopped by to say how completely giddy it makes me, a complete stranger, to read such happy and energetic and hopeful posts! I'm so happy for and proud of you for making this move and taking care of yourself, as I'm sure all your other readers, friends, and loved ones are, too. I hope things continue to improve!! Yay! You're going to love working with Michelle. She is amazing. Omg :O I've been a lurker forever but stopped reading for a while and just started catching up. I LIVE IN ALABAMA TOO! 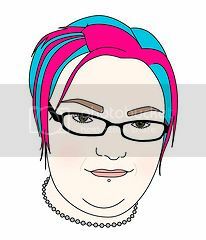 I am always excited to find out that awesome people on the internet live in Alabama, instead of finding out that people I know here are also on facebook, which isn't really the same. Alabama is weird though. We're super weird. But it's nice, still. That is the best stocking I've ever seen! I feel so lucky that I don't have to worry about paying medical fees, medical treatment is free in the UK. I would never have been able to afford my braces if it wasn't for the nhs.